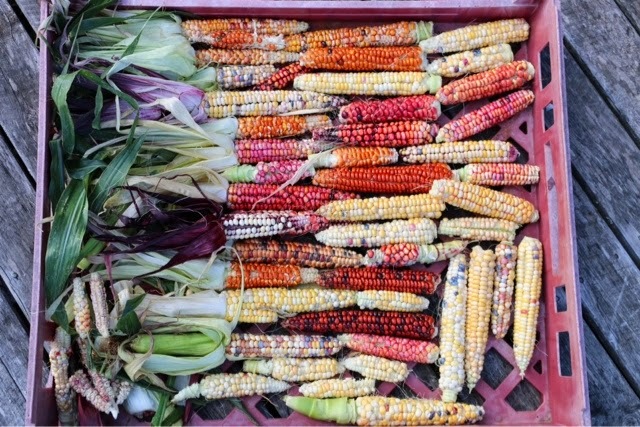 Painted Mountain corn, Uchiki Kuri winter squash and Lazy Housewife beans. This post is a litany of good intentions, naive stupidity and learning from mistakes. You are completely excused for groaning at my ineptitude, or my missing of the bleeding obvious, but, to give me a little credit, although I make a lot of mistakes I'm (sometimes) good at learning from them, and I'm sharing them here so that you can learn from them too. The Three Sisters is a planting method based on a traditional American technique of which I have only a very tenuous understanding. Native American gardens are complex and are based upon values including nutrition, flavour, stewardship of land and soil, and the spiritual significance of specific varieties of plants and parts of plants. 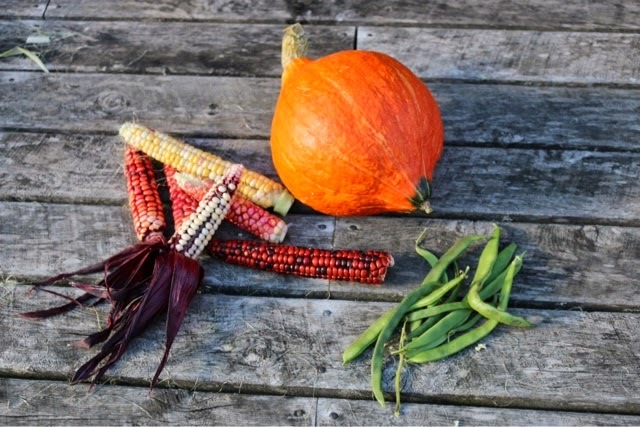 The commonly understood Three Sisters planting includes squash (or pumpkins), corn and climbing beans grown on mounds together, but has countless variations depending on the climate, soil or the gardener. 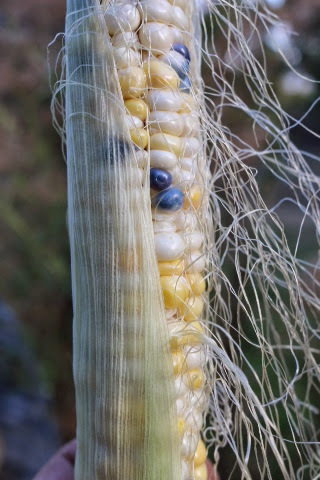 The theory behind the method is that the beans fix nitrogen for the corn and squash, the squash suppresses weeds and provides ground cover, and the corn supports the climbing beans. Here at Provenance Growers we're super keen on polyculture. Growing more than one crop in the same bed can be a really efficient use of space. Some crops can be complimentary to each other's needs as in the scenario above, others just get along well enough that we can increase our yield from a bed by sowing faster growing crops amongst slower ones, others involve planting a new crop among one that is almost finished (right now I'm planning to sow broad bean seed under our tomato plants, when we're done with the tomatoes I'll cut them off at ground level and our beans will take off). Tomatillos self seeded amongst our oca and they both seem happy together, the frost that signals the oca harvest will conveniently kill the tomatillos. Every season sees us trying something new, sometimes failing, others succeeding, always learning. We made our first three sisters mistake at sowing time. I've now learned that you should establish your corn seedlings first, then the beans, and the squash a fair distance away from the other two. Both climbing beans and squash grow fast, the beans need the corn to climb up, and squash will swamp any nearby plants pretty quickly. The second mistake came at planting time, something went terrible awry, we were racing to get our new irrigation system installed and somehow neglected to plant enough pumpkins....zucchini took their place in one bed, volunteer potatoes performed really well in another. The third, and perhaps most vital mistake was in our variety selection. We planted the plants we always have, with the notable exception of the beautiful grinding corn, Painted Mountain, in these pictures. Our friend Fraser from Old Mill Road Bio Farm quickly recognised that you'd be a dill if you grew things that needed regular picking, like those zucchini (oops!) and green beans (oh dear!) 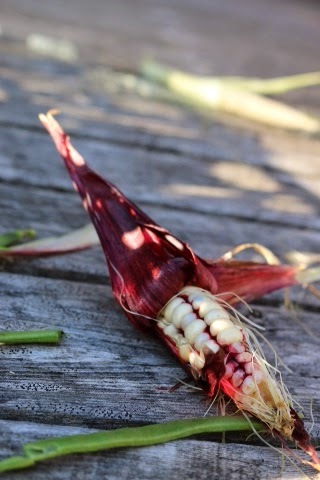 or sweetcorn (bugger!) because the close planting makes getting in to harvest regularly pretty difficult. But we did kick goals with this Painted Mountain, some Uchiki Kuri squash and those volunteer spuds. We also broke the formula by planting in rows rather than the traditional mounds simply because it seems to be the most efficient use of our drip irrigation system. We did make the mistake of planting different varieties in each row, which meant they tasseled at different times, so pollination wasn't as good as it would have been if we'd planted in blocks. Lessons learned, we will get into it again next year with drying beans, winter squash and pumpkins, grinding or popping corn, perhaps potatoes, and, not being one to stick with a winning formula, I might have a go at interspersing some millet or grain amaranth too, along with whichever other whims strike during our cold Tasmanian winter where we huddle by the fire and dream up plans for next springs gardening adventures whilst quietly cursing the quarantine restrictions that mean we're limited to only a few varieties of corn. *Note: We do value greatly the work Quarantine Tasmania do protecting our state from the scourges of pests like fruit fly, we just sometimes get intense seed catalogue lust, which, sadly, must remain unsated. Next season I'm hoping to embark upon these shenanigans on a grand scale. I'm keen to work on growing what is traditionally a cheap commodity, grinding or popping corn, and sharing it with some keen locals who will hopefully enjoy the unique flavours and properties that different strains provide, and the differences in flavour that a locally grown and freshly milled crop can provide, enough to make it a commercially viable adventure. Because if these things aren't commercially sustainable then they're sadly not sustainable at all, no matter how delicious or beautiful they are. And we're hoping to supply seedlings of the plants you'll need to embark on your own Three Sisters adventure next spring, or you can just pop down and see us at market and enjoy the fruits of our experiments. What on awesome technique...such wisdom! I've just done up a resource for work on the three sisters, and you've hit the most important point - this is set up to be a single harvest system! I've recommended people use keyhole beds to try and maximise access and get some sun in there to combat any powdery mildew problems caused by watering sprawling vines. It's great to be able to share your experience. I also attempted to follow the Three Sisters planting method, but with cucumbers instead of beans, and mini melons instead of pumpkin / squash. I did get the corn in first so it was big enough for the cucumbers to climb (pure luck), but the cucumbers didn't climb, instead they rambled along the ground. The melons never took off, probably due to the available space having been used up by the cucumbers. 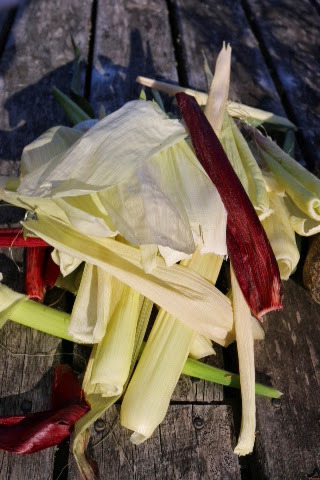 However, the corn and the cucumbers did very well, and I will do it again next year, with corn, beans and cucumbers. Paulette, this is a great post. Thank you. I was just linking to your page from a recipe I was writing that included kunzea. I have a quick question, are popping and grinding corn the same thing? Do/can you pop the pretty mountain corn?